Excavating the history of words can sometimes be as revealing as excavating the ruins of an ancient city. Take the English word “enthusiasm.” Today, we see this as something positive. One dictionary defines it as “a feeling of energetic interest in a particular subject or activity and an eagerness to be involved in it.” People with enthusiasm have passion, zest and excitement, and this can be contagious. It is one of the gifts of a great teacher or leader. People follow people of passion. If you want to influence others, cultivate enthusiasm. But the word did not always have a favourable connotation. Originally, it referred to someone possessed by a spirit or demon. In seventeenth-century England, it came to refer to extreme and revolutionary Protestant sects, and more generally to the Puritans who fought the English Civil War. It became a synonym for religious extremism, zealotry and fanaticism. It was looked on as irrational, volatile and dangerous. David Hume (1711-1776), the Scottish philosopher, wrote a fascinating essay on the subject. He begins by noting that “the corruption of the best things produces the worst,” and that is especially true of religion. There are, he says, two ways in which religion can go wrong: through superstition, and through enthusiasm. These are quite different phenomena. Superstition is driven by ignorance and fear. We can sometimes have irrational anxieties and terrors, and we deal with them by resorting to equally irrational remedies. Enthusiasm is the opposite. It is the result of over-confidence. The enthusiast, in a state of high religious rapture, comes to believe that he or she is being inspired by God Himself, and is thus empowered to disregard reason and restraint. Enthusiasm “thinks itself sufficiently qualified to approach the Divinity, without any human mediator.” The person in its grip is so full of what he takes to be holy rapture that he feels able to override the rules by which priestly conduct is normally governed. “The fanatic consecrates himself and bestows on his own person a sacred character, much superior to what forms and ceremonious institutions can confer on any other.” Rules and regulations, thinks the enthusiast, are for ordinary people, not for us. We, inspired by God, know better. That, said Hume, can be very dangerous indeed. We now have a precise description of the sin for which Nadav and Avihu, the two elder sons of Aaron, died. Clearly the Torah regards their death as highly significant because it refers to it on no fewer than four occasions (Lev. 10:1-2, 16:1, Num. 3:4, 26:61). It was a shocking tragedy, occurring as it did on the day of the inauguration of the service of the Mishkan, a moment that should have been one of the great celebrations in Jewish history. The sages themselves were puzzled by the episode. The text itself merely says that “they offered unauthorised fire [esh zarah] before the Lord, that He had not commanded. So fire came out from the presence of the Lord and consumed them, and they died before the Lord.” Evidently the sages felt that there must have been something else, some further sin or character flaw, to justify so dire and drastic a punishment. Putting together clues in the biblical text, some speculated that they were guilty of entering the Holy of Holies; that they had given a ruling of their own accord without consulting Moses or Aaron; that they had become intoxicated; that they were not properly robed; that they had not purified themselves with water from the laver; that they were so self-important that they had not married, thinking no woman was good enough for them; or that they were impatient for Moses and Aaron to die so they could become the leaders of Israel. Some speculated that the sin for which they were punished did not happen on that day at all. It had occurred months earlier at Mount Sinai. The text says that Nadav and Avihu along with seventy elders ascended the mountain and “saw the God of Israel” (Ex. 24:10). God “did not raise his hand against the leaders of the Israelites; they saw God, and they ate and drank” (Ex. 24:11). The implication is that they deserved punishment then for not averting their eyes, or for eating and drinking at so sacred an encounter. But God delayed the punishment so as not to cause grief on the day He made a covenant with the people. Priests understand the power, and thus the potential danger, of the sacred. That is why holy places, times and rituals must be guarded with rules, the way a nuclear power station must be protected by the most careful insulation. Think of the accidents that have occurred when this has failed: Chernobyl, for example, or Fukushima, in Japan in 2011. The results can be devastating and lasting. To bring unauthorised fire to the Tabernacle might seem a small offence, but a single unauthorised act in the realm of the holy causes a breach in the laws around the sacred that can grow in time to a gaping hole. Enthusiasm, harmless though it might be in some of its manifestations, can quickly become extremism, fanaticism and religiously motivated violence. That is what happened in Europe during the wars of religion in the sixteenth and seventeenth centuries, and it is happening in some religions today. As David Hume observed: “Human reason and even morality are rejected [by enthusiasts] as fallacious guides, and the fanatic madman delivers himself over blindly” to what he believes to be Divine inspiration, but what may in fact be overheated self-importance or frenzied rage. We now understand in detail that the human brain contains two different systems, what Daniel Kahneman calls “thinking fast and slow.” The fast brain, the limbic system, gives rise to emotions, particularly in response to fear. The slow brain, the prefrontal cortex, is rational, deliberative, and capable of thinking through the long term consequences of alternative courses of action. It is no accident that we have both systems. Without instinctive responses triggered by danger, we would not survive. But without the slower, deliberative brain, we would find ourselves time and again engaging in destructive and self-destructive behaviour. Individual happiness and the survival of civilisation depend on striking a delicate balance between the two. Precisely because it gives rise to such intense passions, the religious life in particular needs the constraints of law and ritual, the entire intricate minuet of worship, so that the fire of faith is contained, giving light and a glimpse of the glory of God. Otherwise, it can eventually become a raging inferno, spreading destruction and claiming lives. After many centuries in the West, we have tamed enthusiasm to the point where we can think of it as a positive force. We should never forget, however, that it was not always so. That is why Judaism contains so many laws and so much attention to detail — and the closer we come to God, the more we need. David Hume, “Of Superstition and Enthusiasm,” in Essays Moral, Political, and Literary (1742-1754). This is based on the statement in Lev. 16:1, that the two sons of Aaron died when “they drew near before the Lord,” implying that they had come too close, i.e. they had entered the Holy of Holies. The seventy elders were punished later. See Rashi to Ex, 24:10. Midrash Aggadah (Buber) ad loc. Covenant and Conversation 5776 on Spirituality is kindly supported by the Maurice Wohl Charitable Foundation in memory of Maurice and Vivienne Wohl z”l. To join Rabbi Sacks’ mailing list, please subscribe via www.rabbisacks.org. You can also follow him on Twitter and Facebook. His internationally bestselling book — ‘Not in God’s Name: Confronting Religious Violence’— is available to order here. 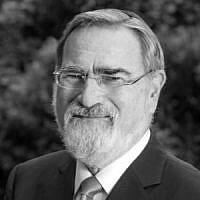 Rabbi Lord Jonathan Sacks is a global religious leader, philosopher, the author of more than 25 books, and moral voice for our time. Until 1st September 2013 he served as Chief Rabbi of the United Hebrew Congregations of the Commonwealth, having held the position for 22 years. To read more from Rabbi Sacks or to subscribe to his mailing list, please visit www.rabbisacks.org.